Ditch the cutlery, ladies and gentlemen. 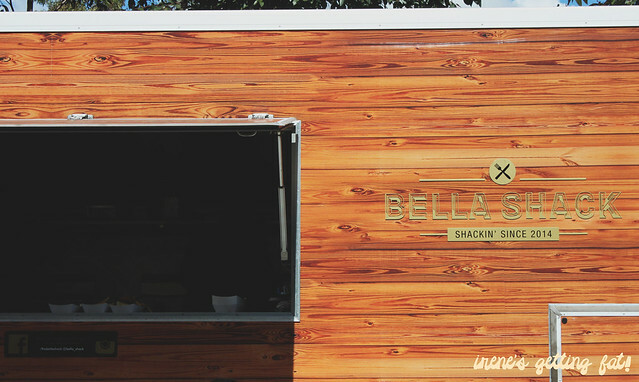 Use those hands and keep serviettes handy because the burgers from Bella Shack are a hands-on affair. 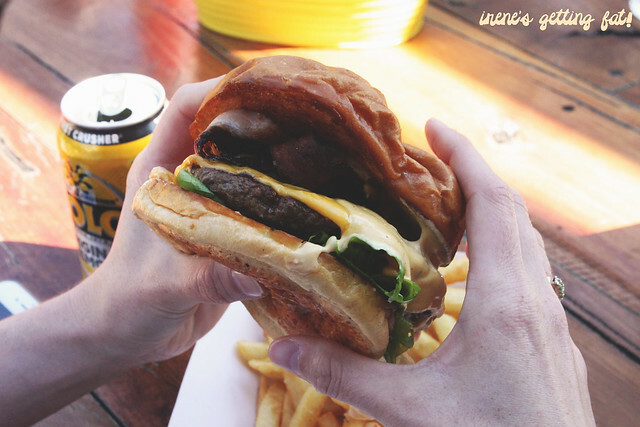 Burger waves are currently rocking Sydney, and I cannot be happier. Gimme those soft milk buns with the juicy, succulent pink patty, with those crispy bacon rashers, and the melty cheese. A pickle or two wouldn't hurt either. 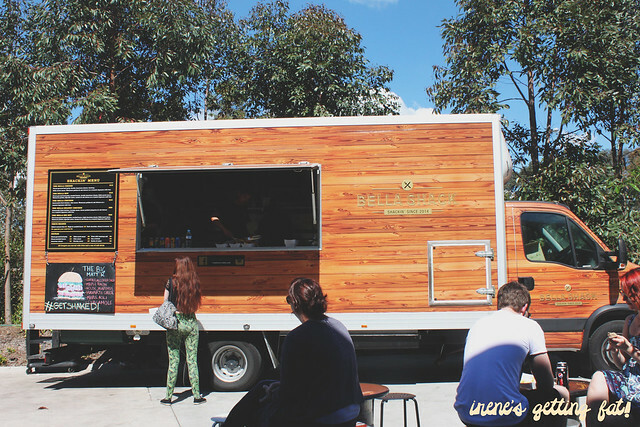 Bella Shack parked at the outdoor area of Bella Vista Hotel, the timber-coloured truck pumping out awesome-looking burgers to keen hands of customers. They have a few items on the menu, but it is the specials that you need to keep an eye on - they change weekly. Every burger is served with sea salt & rosemary chips and a drink, which explains the slightly higher price tag. 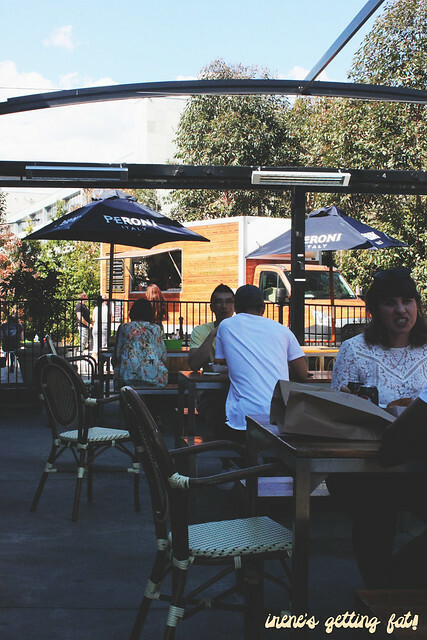 On a sunny day, the outdoor seating is a perfect spot to absorb both sunshine and delicious calories from the hefty, fat burgers. 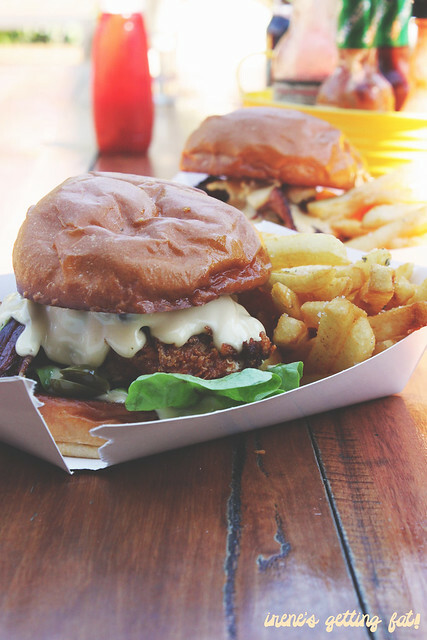 Before talking about the burgers, can we just discuss the fries? They are absolutely impeccable. You know how sometimes even in a great cup of fries you always find a dense, stale one that does not seem to fit in that cup? There is no such thing here. Every baton of the fries is glorious; crunchy edges, and super soft, pillowy innards. And they are perfectly seasoned with the sea salt & bits of rosemary. Between the two of us, we can only try two items. So we went to one from each category: the meat and the poultry. The Bella Boy has everything you could ever ask for from the burger god: house-ground beef patty, smoked bacon, double American cheese, Bella secret sauce, Westmont pickles, Spanish onion, tomato & lettuce on a toasted Japanese milk bun. Honestly don't know how to describe this beaut. There are a lot of things going on, but they just work so well. 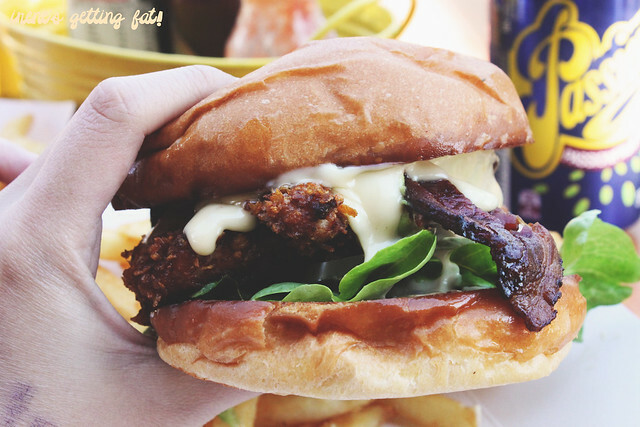 The patty cooked to perfection, the smoky, crispy bacon, the cheese, fenced by the creamy, tasty sauce. The milk bun is incredible too - very soft yet yielding a few crispy edges. The special of the week is The Big Matt'r. Combination of Japanese milk bun sandwiching cornflake fried chicken, maple bacon, house jalapenos, havarti cheese, maple aioli, and guacamole. The chicken is magnificent - very crispy batter with juicy chicken, somehow-buttery cheese that is super melty, and of course, the sweet bacon. I wish it has more jalapenos, though. Avocado fans may protest that the guac flavour is barely there, but I have no problem with that at all. The serving size is pretty massive for me, but if you're not full after devouring the burgers, they got desserts like salted caramel slice ($8), maple & candied bacon ($8), and dark chocolate, cherry, coconut ($8). Or you also have the option of upgrading your meal for $5. 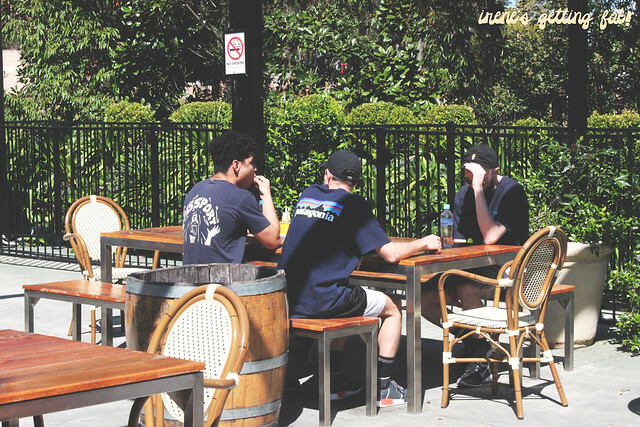 The area is probably not too familiar for some, after all, Bella Vista is no Surry Hills, but believe me it will be worth the trip. Amazing burgers with slightly higher price, great ambiance and seating, service is pretty quick although there is no table service. Cornflake fried chicken and maple bacon? Let me at it!